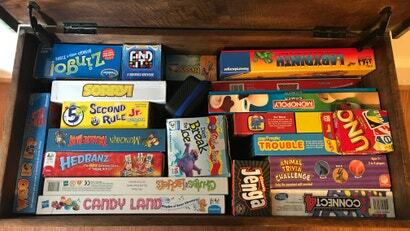 My daughter has some stacking shelves in her bedroom closet where she keeps her board games. I put up with them because they’re better than my previous organisation method of nothing, but I’m quickly realising they are less than ideal. If she tries to grab, say, Hoot Owl Hoot, and it’s at the bottom of one of the shelves, the games on top of it come crashing down. That board game tower gives me mild anxiety, now that I think about it. Some games feature playing cards that slip out of the holding trays when stored vertically. This is particularly prevalent when the game tray designer leaves room for expansion packs of cards. When the cards slip out of their tray they can end up in an awkward position and bend over time. Bent cards aren't the worst thing in life, but it can make shuffling trickier and allow a cluey player to guess what card you're playing a little easier.